Using my phone for photos is not my first choice, but it does work fairly well. If you are one of those who takes lots of photos using your phone, I have a little piece of advice. Check the lens and make sure it is clean. It is amazing how gummy and dirty those little lenses can become. Scuzzy may be the right word for how mine looked the other day. 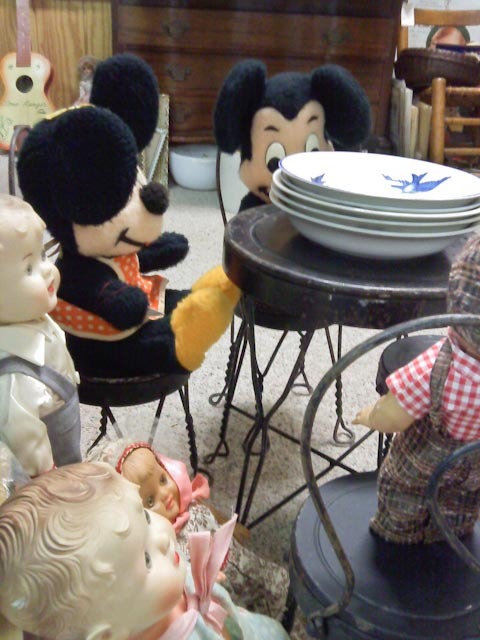 Today we made our way to a favorite antique place along I-75 in Findlay, Ohio. You can spend hours in there, going from booth to booth, seeing all the amazing stuff that is on display. After a while it all seems to look the same to me. 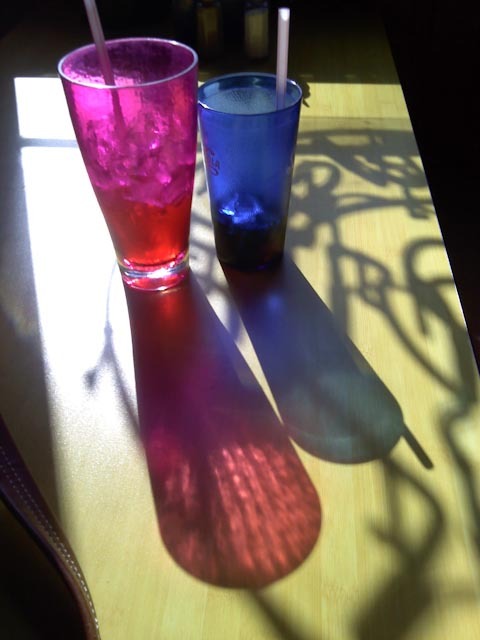 The same old dishes, same funky lamps and vases, furniture from when I was a kid. 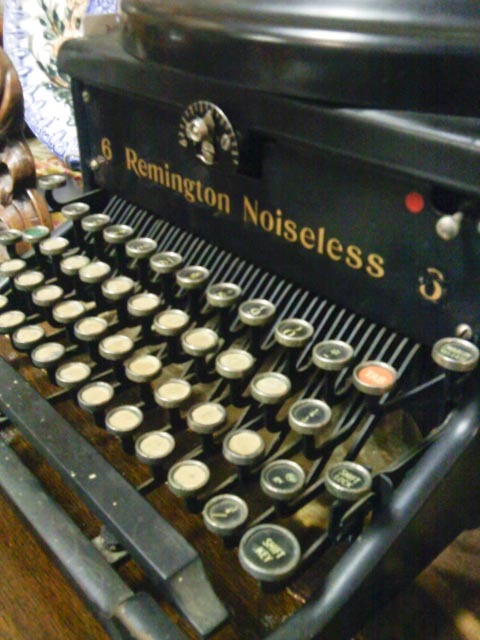 This old typewriter was one of the cool things we saw today. I am amused at the word “Noiseless”! I wonder if it really was? And there was this pink “exercise” thingy. I don’t know what the actual name of it was, but I do remember seeing these advertised on TV. I think all the machine did was shake you. You put the strap around your middle and turn the thing on and it vibrated. Will someone tell me how that helped get you in shape? This little tea party of stuffed animals and dollies just called to the little girl in me. I know, it’s just an arrangement. But…what happens when we are not looking? What happens after dark when all the shop keepers go home? 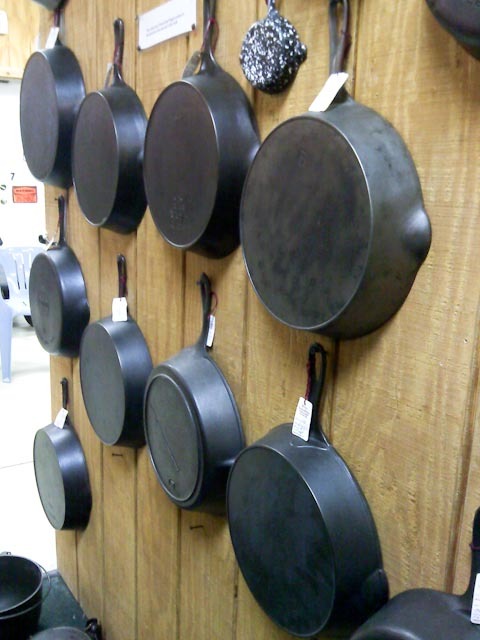 There is always an abundance of old iron skillets, as you see here, in various shapes and sizes. I have an iron skillet that I use pretty regularly, so I often wonder how a cook could give these up. We came home saying that there was nothing at the antique shop that just had to come home with us. It was just good to get out and see our little part of the world for a while. I followed this up with a lovely two hour nap on the couch, accompanied by two cats. 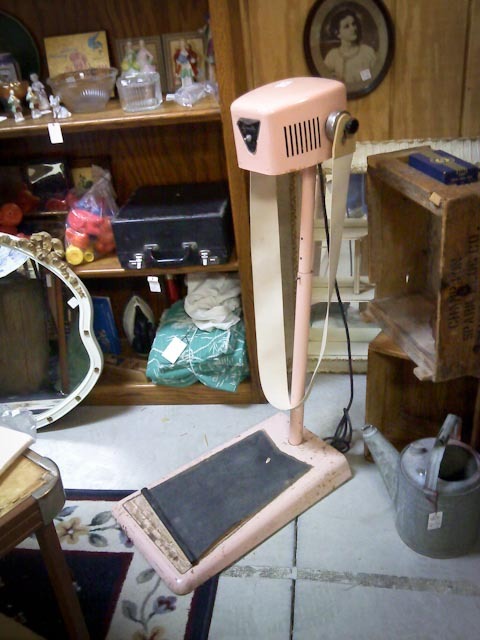 Oh I love going to antique places…they are filled with all kinds of treasures. That old typewriter if priced right would have come home with me for sure. Just so you know, Deanna, my husband says this one was priced at $95. Oh, you said it all! Yes, when the toys I played with and the common every day things I grew up with are now available in these antique shops…I begin to feel antique myself! Sounds like my kind of day! Browsing through antique stores full of things I recognize and seeing things I once owned!! Love the typewriter! Noiseless, that made me smile too! My aunt had one of those exercise machines and I got to try it; I was in my early 20's at the time! Your right, it won't do a thing for you but make you giggle!! Thanks so much Deb for sharing!